"Deborah Hustic aka body pixel – artist, blogger, web dreamer… working with analogue and digital media." 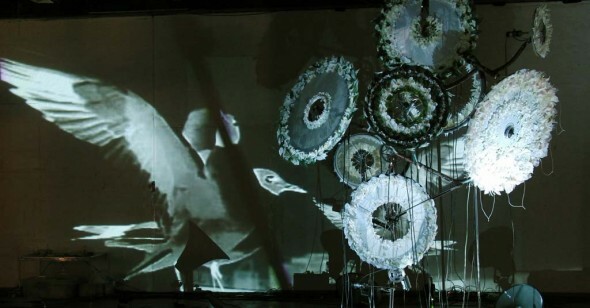 Call for artists, performers, scientists, researchers - submission deadline 18th April. Visit scientific-theatre.com for details. Our archive is a treasure chest! This week we uploaded a serious of great videos both performances & documentaries of/about Stelarc's ground breaking works from 90's! APODIO is a GNU/Linux platform containing audio, text-friendly, 3D, Streaming, graphic, Live Coding and video tools. It can be used as a liveDVD or be installed on a partition of your hard disk (on any PC 32bits to Mac Intel). Great resource : Contemporary Art and New Media: Toward a Hybrid Discourse? and Sunday, February 27 at 5pm.